Researchers at Carnegie Mellon University have put together a new type of robot – dubbed “Ballbot” – that balances and moves on a single large ball, rather than legs or wheels. 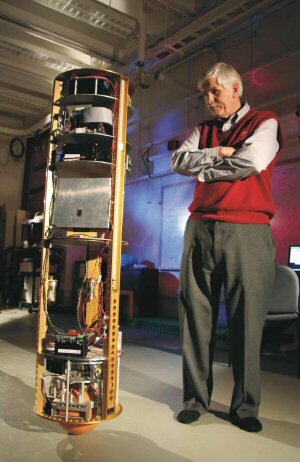 Created by Carnegie robotics boffin Ralph Hollis, Ballbot is a self-contained, battery-operated, omnidirectional robot that balances dynamically on a single urethane-coated metal sphere. Ballbot weighs 95 pounds and is the approximate height and width of a person. Because of its long, thin shape and ability to maneuver in tight spaces, Hollis says Ballbot has the potential to function and interact with people much more effectively than other types of robot. Ballbot has an onboard computer that reads balance information from its internal sensors, activating rollers that mobilize the ball on which it moves – something akin to how a mouse-ball moves. Hollis believes Ballbot provides an alternative to not only multi-wheeled robots, but also legged robots, which he says are complex and expensive. Check out the Ballbot page at CM for more info and some videos!